On Monday, May 19, a federal judge in U.S. District Court in Washington ruled that the government had adequately replied to four advocacy groups' Freedom of Information Act request and was not required to submit any further information regarding its use of new surveillance powers granted under Section 215 of the USA Patriot Act. In a decision that the Authors Guild, American Booksellers Foundation for Free Expression (ABFFE), and Association of American Publishers (AAP) hailed as a victory for free expression, Assistant U.S. Attorney David C. Esseks dropped an attempt to jail a cooperating witness who shared his story in a recently published book. "We're very happy with [the decision], it's a great result," said Paul Aiken, executive director of the Authors Guild. "This time the law worked the way it ought to." On May 7, Chuck Robinson, owner of Village Books in Bellingham, Washington, was presented with this year's Liberty Bell Award by the Whatcom County Bar Association. The award acknowledges outstanding community service to the legal system by a non-attorney, including encouraging a sense of civic responsibility and contributing to good government. A member of the Board of Directors of the American Booksellers Foundation for Free Expression, Robinson served on the American Booksellers Association Board and was its president from 1992 - 1994. On Thursday, May 15, thirty-five organizations -- including the American Booksellers Foundation for Free Expression (ABFFE), American Booksellers Association, American Library Association (ALA), Barnes & Noble Booksellers, and Borders Group Inc. -- issued a statement supporting the Freedom to Read Protection Act (H.R. 1157). The bill, which was introduced in the U.S. House of Representatives on March 6 by Congressman Bernie Sanders (I-VT), would remove a threat created by the USA Patriot Act to the privacy of bookstore and library records. In an unfortunate illustration of taxing Peter to pay Paul, on May 1, members of the Rhode Island Senate proposed an additional one percent sales tax on all books sold in Rhode Island by any retailer. According to the amendment offered by State Senators Rhoda Perry, Frank Ciccone, and Juan Pichardo, the tax generated would be used by cities and towns exclusively for free public libraries. In Las Vegas, several free speech groups, led by the American Civil Liberties Union of Nevada (ACLUN), are asking a federal judge to lift a ban on a book written by an anti-tax activist. 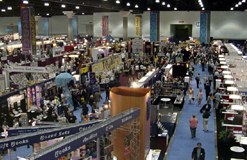 At this year's BookExpo America (BEA), the American Booksellers Foundation for Free Expression (ABFFE) plans to have something for everyone, ranging from serious discussions on free expression issues to award-winning comedy to a silent auction, offering great bargains. On Saturday, May 31, Vermont Congressman Bernie Sanders (I), sponsor of the Freedom to Read Protection Act, will participate in a panel on the First Amendment. The Pacific Northwest Booksellers Association (PNBA) recently sent a petition on behalf of its members to all U.S. congressional representatives from Alaska, Idaho, Montana, Oregon, and Washington urging support of H.R. 1157, the Freedom to Read Information Act, which would repeal Section 215 of the USA Patriot Act. The FBI's expanded authority under Section 215 of the USA Patriot Act allowing it to secretly request and serve a subpoena for bookstore and library records has spurred a small number of booksellers to ask their point-of-sale (POS) systems vendors to purge their databases of customers' title-specific purchase records, according to vendors who spoke to BTW. Support for H.R. 1157, the Freedom to Read Protection Act, continues to build. Ten additional members of Congress have recently become co-sponsors of the bill, which would remove a threat created by the USA Patriot Act to the privacy of bookstore and library records. The members join Rep. Bernie Sanders (I-VT) and 65 other members of Congress. Attorney Theresa Chmara, a partner with the law firm of Jenner & Block in Washington, D.C., has been named the recipient of the 2003 Freedom to Read Foundation Roll of Honor Award. Chmara is general counsel of the Freedom to Read Foundation and a member of the Board of Directors of the American Booksellers Foundation for Free Expression. Chmara was also part of the legal team representing ABA in its lawsuit against Barnes & Noble and Borders. On Thursday, April 25, two days after a federal judge in Arkansas ordered the Cedarville School District to put the Harry Potter series back on school library shelves, the Cedarville School Board voted not to appeal the federal court order, as reported by the Associated Press. Last July, two Cedarville parents filed a federal lawsuit challenging the school board's decision to restrict access to the Potter series.